The narrowband IoT (NB-IoT) chipset market is expected to grow from USD 16.7 Million in 2017 to USD 181.02 Million by 2022, at a CAGR of 61.06% during the forecast period. The base year considered for the study is 2015, and the market size forecast has been given for the period between 2017 and 2022. This report provides valuable insights into ecosystem of this market including software provider, cloud infrastructure provider and automotive manufacturing companies. The major players in NB-IoT chipset market are Huawei Technologies Co. Ltd. (China), Ericsson (Sweden), Vodafone Group PLC (U.K.), Qualcomm Incorporated (U.S.), Intel Corporation (U.S.), Samsung Electronics (South Korea), Nokia Corporation (Finland), Verizon Communication (U.S.), CommSolid GmbH (Germany), U-Blox Holding AG (Switzerland), Sequans Communications S.A. (France) and MistBase AB (Sweden). According to the Markets and Markets forecast, narrowband IoT (NB-IoT) chipset market is expected to grow from USD 16.7 Million in 2017 to USD 181.02 Million by 2022, at a CAGR of 61.06% between 2017 and 2022. The increasing adoption of IoT and growth in network-enabled devices, and demand for long-range connectivity is driving the market. The existing LPWA technologies are fragmented, non-standardized, and require a high operational cost. The narrowband IoT (NB-IoT) technology is expected to overcome these shortcomings as it is highly reliable, consumes less power, and has low operational cost. This report segments the NB-IoT chipset market based on offering, device, deployment type, end-use application, and geography. The market has been segmented on the basis of offerings into hardware, software, cellular network, and services. The market for software is expected to hold the largest market in 2017. The increasing adoption of machine-to-machine connectivity is expected to increase the need for managing the devices from remote locations which is the major driver for the growth of software solutions in the NB-IoT chipset market. In terms of deployment type, guard band deployment technique is expected to hold the largest share in 2017. The market for standalone is expected to grow at the highest rate between 2017 and 2022. The standalone deployment technique for NB-IoT is considered to good option for LTE networks running in parallel with GSM as it allows steering some GSM/GPRS traffic to the LTE network, resulting in one or more of the GSM carriers to be used to carry IoT traffic. This approach also accelerates time to market, and maximizes the benefits of a global-scale infrastructure once NB-IoT has been successfully tested. On the basis of device, the alarm & detectors devices expected to hold the largest market share in 2017. However, the market for trackers is expected to grow at the highest growth rate during the forecast period. Due to increasing fraudulent activities such as theft, missing shipments, and so on, the companies are using tracking device to get real-time location of their vehicles and shipments. On the basis of end-use application, the infrastructure application is expected to hold the largest market share in 2017. The usage of safety alarms and detectors is increasing across several end-user industries. Sensors have been effectively deployed in many applications for monitoring purposes. The market for automotive & transportation application is expected to grow at the highest rate during the forecast period due to increase in infotainment and telematics applications. North America accounted for the largest share of the NB-IoT chipset market. The U.S. is major contributor to the growth of NB-IoT chipset market in North America. Investment from U.S. government towards implementation of IoT across various sectors such as infrastructure and utilities under programs such as “Smart America” is driving the North America market for NB-IoT chipset. Deployment of smart city and smart infrastructure in countries such as China, Japan and India contributes to the highest growth of the Asia-Pacific region during the forecasted period. Low-speed data transmission rate and privacy & security concern are expected to limit the growth of this market. 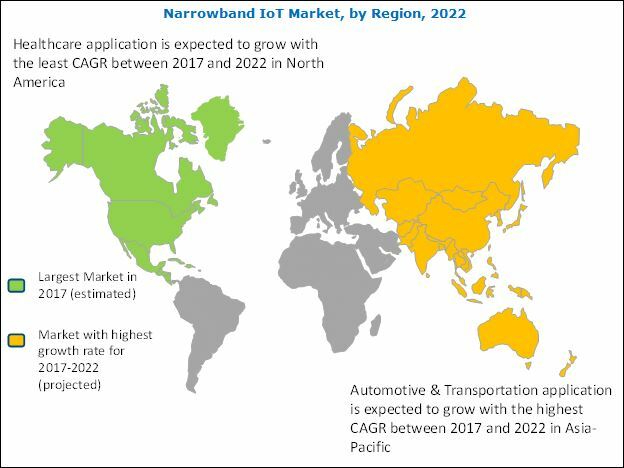 The major players in narrowband IoT market are Huawei Technologies Co. Ltd. (China), Ericsson (Sweden), Vodafone Group PLC (U.K.), Qualcomm Incorporated (U.S.), Intel Corporation (U.S.), Samsung Group (South Korea), Nokia Networks (Finland), Verizon Communication (U.S.), CommSolid GmBH (Germany), U-Blox Holding AG (Switzerland), MistBase AB (Sweden). Huawei (China) is one of the major player in NB-IoT chipset market. Huawei (China) has been conducting NB-IoT trial in collaboration with major players such as Vodafone (U.K.), Ericsson (Sweden), China Unicom (Beijing). 12.2 Huawei Technologies Co. Ltd.